Hot or Not is an iconic web 1.0 site with a basic concept: Look at a picture of a person and mark on a scale of 1-10 how hot they are. Command Shift 3 takes the same concept and applies it to web design. 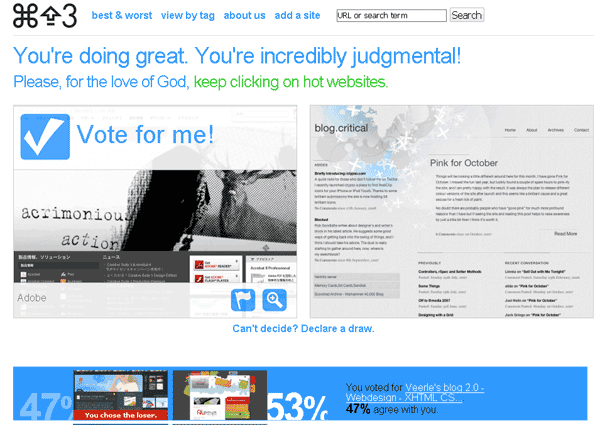 Frankly I find the web design implementation far more interesting than the original Hot or Not concept. But judging a website on a scale of 1-10 sounds overly-complicated. CommandShift3.com instead puts two websites side by side and it is your job as the all-knowing visitor to click on which one you like best. The cool thing is you can see if you picked the crowd favorite and what percentage of people agree with you. If you like a site so much you can click through and leave a comment about it or visit the actual page. Too lazy to wade through the thousands of contenders? Then check out the Best & Worst sites in a variety of time frames. And if you are looking for something specific you can search by keyword or browse their tags. While the concept is super simple to grasp, the impact of a site like this is a lot more compelling than the loads of CSS galleries that litter the net. The interaction and side by side comparison really set it apart in the showcase arena. I enjoy the simplicity of the site, showing me only two designs at a time instead of bombarding me with thumbnails like some other sites do. In conclusion, this site is a great way to get a taste of some great web design that is out there on the net while keeping it fun and engaging. I added my blog to the fray to see how it would stand up. Wish me luck, and we’ll see if my design chops can rise above the crowd. Oh and in case you didn’t know, Command Shift 3 is the keyboard shortcut to take a picture of the screen in Mac OS X. Nice detailed list! we ask that you consider including http://CSSGallery.com in your resource listing. Cheers!